ThinkSystem SR650 supports Intel® Optane™ DC Persistent Memory and up to two next-generation Intel® Xeon® Processor Scalable family CPUs, with up to 36% total performance improvement compared to the previous generation. * It supports two 300W high-performance GPUs and ML2 NIC adapters with shared management. Unique Lenovo AnyBay technology provides the flexibility to mix-and-match SAS/SATA HDDs/SSDs and NVMe SSDs in the same drive bays. Support is now available for up to 24 NVMe drives. Four direct-connect NVMe ports on the motherboard provide ultra-fast read/writes with NVMe drives and reduce costs by eliminating PCIe switch adapters. Plus, storage can be tiered for greater application performance, to provide the most cost-effective solution. Optional mirrored M.2 drives ensure reliability and quick OS initialization. SR650 also features 80 PLUS Platinum and Titanium PSUs, as well as continuous operation at 45°C, to reduce energy costs. Lenovo ThinkShield is a comprehensive end-to-end approach to security that begins with development and continues through supply chain and the full life cycle of the device. 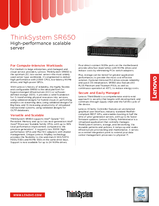 Lenovo XClarity Controller features an uncluttered graphical user interface, industry standard Redfish-compliant REST APIs, and enables booting in half the time of prior generation servers, with up to 6x faster firmware updates. Lenovo XClarity Administrator is a virtualized application that centrally manages ThinkSystem servers, storage, and networking. Via reusable patterns and policies, it ramps up and scales infrastructure provisioning and maintenance. It serves as a central integration point to extend your data center management processes to physical IT. Running XClarity Integrators in external IT applications, or integrating through REST APIs, helps you further speed services provisioning, streamline IT management, and contain costs. To learn more about the Lenovo ThinkSystem SR650, contact your Lenovo representative or Business Partner or visit www.lenovo.com/thinksystem. For detailed specs, consult the SR650 Product Guide. * Intel internal testing, August 2018. † ITIC 2018 Global Reliability Report. ‡ TBR x86-based Servers Report 2018. Document number DS0032, published February 19, 2018. For the latest version, go to lenovopress.com/ds0032.